So-called Fire Rainbows actually have nothing to do with fire or rainbows, however they are absolutely awesome! The correct nomenclature for this optical phenomenon is circumhorizontal arc (circumhorizon arc and lower symmetric 46° plate arc are also accepted). 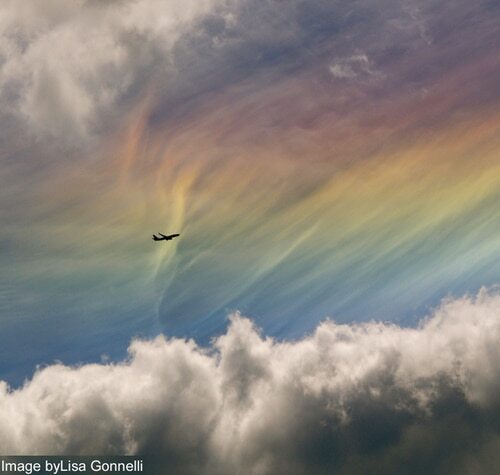 A multi-colored halo (spanning from the red wavelengths at the top to the indigo like a rainbow) that runs parallel to the horizon occurs when the sun’s height in the sky is more than 58° above the horizon and its light passes through a cirrus cloud or haze consisting of ice crystals. These ice crystals must be hexagonal and plate-shaped, facing parallel to the ground. When light enters the top of the ice crystal through its vertical side face, and exits bending through the lower horizontal face, it separates like a prism.